While earliest records indicate that Portuguese nationals found their way to New Jersey's shores as early as 1725, it was not until the United States census of 1850 and 1860 that names such as Mendes, Carvalho, Silva, Medeiros, Mello, and Treitas were found in places such as Jersey City, Bayonne, Newark, Elizabeth, Atlantic City and Cape May. By the midpoint of the last century, two dozen Portuguese immigrants were employed by the old Camden and Amboy Railroad. At the outbreak of World War I, Portuguese-Americans were actively being recruited to work in Newark's chemical factories, breweries, tanneries and at Public Service. At first, they found themselves surrounded by the old immigrant groups of Germans, Italians, Poles, Lithuanians and Irish, but gradually as the century wore on, their number increased many fold. While many Portuguese immigrants came directly here, others arrived after spending a period of their lives in Brazil or in New England. Indeed, the depressed New England shoe industry of the 1920s tended to encourage movement to greener financial pastures, and Newark was on the top of the list for resettlement. News on the New York and Brooklyn docks also indicated that work was waiting in the Ironbound's booming factories. Newark was also attractive to the new immigrants for other reasons, namely because it lacked the Yankee discrimination, because of its prominence to Manhattan and Brooklyn, and finally, because it had a reputation for treating the newly arrived immigrant well. In spite of the damage inflicted on the city by the Depression, Newark was still considered an attractive place to settle. Between 1928 and 1933, six Portuguese-language newspapers were published here. Dan, once known as 'Albino' Rodrigues, was born in mainland Portugal. He left home at 13 to seek his fortune in Belem, Brazil, where he hoped to make good in that country's rubber economy. However, he arrived in a depressed economy and soon sailed for North America as a stowaway. Halfway through the voyage, he was caught and put in charge of caring for live animals being sent to a New York City zoo. Upon arrival in Brooklyn, he escaped detection with the help of a German doctor who had befriended him and thus he avoided almost certain arrest. He later entered the country legally, but his first experience in America was as a wanted man. After sleeping on the Brooklyn docks for several nights, he learned of the Ironbound, where he quickly found another friend, simply know as Mr. Rocha, who helped him by purchasing badly needed work clothes for him. His benefactor's only request was that he help someone in the future – and help he did during most of his lifetime. The Rodrigues were married in 1939. In 1946, on March 28th, their shared birthday, they built their new home at 91 McWhorter St., where the iron gateway still bears the initials D.R. Dan's Friendly Service was run by the team effort. At first, they packed containers for overseas shipping. Later, they hauled ice, then kerosene, and finally fuel oil. A well-known business, catering not only to the Ironbound's Portuguese community, it was an enterprise that served a multicultural neighborhood as well. Dan ran the field operations, and Elvira managed the office functions. As the business expanded and employees were added, the family began acquiring property in the neighborhood. Eventually, real estate was added to its list of activities. But the simple kindnesses of the German doctor and Mr. Rocha were not forgotten. The stories about giving back to the less fortunate would fill a family scrapbook. Dr. Linda Rodrigues noted that her family never ate alone, that her father once drove an injured escaping alien to a South Jersey hospital to avoid arrest. Often, her father would come home with little change in his pocket because he had just helped somebody in trouble. 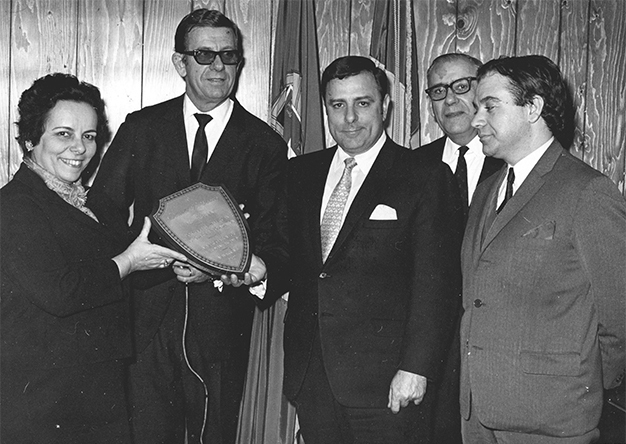 Elvira Rodrigues was equally unique as a Portuguese-American businesswoman who was deeply involved in every aspect of her husband's successful business. Beside her mercantile talents, she served as trustee of the Newark Public Library and was active with her husband in several mainland Portuguese charities. Daughters Linda and Nancy Rodrigues maintain that if an atomic bomb were to have fallen on Newark, Dan would have ignored it, and Elvira would have managed it. Mario Teixeira V was born in Newark. His great-great grandfather was from Villa Nova De Gaia near Oporto, and his great grandfather was part of the 'Old Guard.' The first Mario Teixeira was a prosperous textile factory owner in Portugal who briefly visited the United States some years ago. Mario II migrated to the United States in the 1920s via New England and worked briefly in a coal mine before deciding that life as a miner was not for him. Instead, most of his life was spent as the 'Unofficial Postmaster and Banker of Wilson Avenue' while running a dry goods store at 100 Ferry St., where he handled the affairs of dozens of newly arrived immigrants. Although he was in the dry goods business, he handled the financial affairs of countless Portuguese Newarkers, helping them fill out endless legal forms, locating lodgings, assisting with affidavits, completing translations, acting as a notary, filing income tax forms, and completing wine permits. When the Great Depression came to Newark in 1929, his business went bankrupt. Too many people had borrowed too much credit, and when it was time to collect many store owners simply could not pay the piper. Teixeira went to work at Hyatt Roller Bearing, but he continued to work with the community as if they were still members of the family. In 1939 Rodrigues and Jardim were charter members of the Portuguese Sport Club. They negotiated for the purchase of the steel used in the construction of the old 1939 World's Fair Pavilion for reuse in the Newark Sport Club. In 1947, Mario Teixeira Jr., was now owner of Buyus Funeral Home, and his father visited Portugal. In keeping with the custom of prosperous Europeans, they dressed for dinner and spent afternoons hunting small game in the nearby woods. Like Vasco Jardim and Dan Rodrigues, Texeira showed fatherly concern for newly arrived Portuguese immigrants, a constant passion throughout his life.